Some of the newest stained glass windows in a Westerville church are old and from Cleveland, Ohio. In Westerville at St. Paul the Apostle Church the rose window on the front of the church was installed Wednesday, March 27, 2013. Contributions from parishioners to purchase the “rose” window. The church installed the rose window in honor of Father Raymond Lavelle. St. Paul the Apostle Catholic Church is at 313 N. State Street, Westerville, Ohio 43082. The photo above taken March 28, 2013 with my cell phone’s camera for a Foursquare “check – in”… is not so hot. Embarrassing? No. It’s 2013. I am not a photographer. My phone is not a camera. My cell phone has a camera, the camera on my phone serves it’s purpose. One of my favorite photos of the church while it was under construction is in Inside St. Paul Church in Westerville. 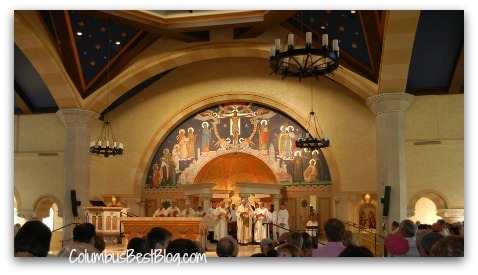 The photo taken in 2011 while the church was under construction, a first peek at the inside for most of us. Look at those cell phones. I started photographing the church while it just the steel skeleton against the sky. The windows in the photo at the top have been in St. Paul Church for some time. If you want to see a good photo of the new stained glass window go to Gary Gardiner’s Facebook page. Gardiner is a professional photographer… he has a camera, has talent. That makes all the difference in the world in photography. I could sign up for Gardiner’s “Be a better photographer” newsletter…. Gardiner took his photo of the rose window inside the church, up in the choir loft. Or perhaps that area is known as the organ loft. There is a lot of detail in the newly installed stained glass window at the Westerville church. I had no inkling the rose window had a scene of the crucifixion. In my photo all you can see is a blur of colors. Last night in real life with the light on behind the stained glass window, the scene in the stained glass is very crisp and clear. I’d rather link to a photo on Gardiner’s website than to Facebook, but I do not see a photo there yet. www. GaryGardiner.com (link below) Gardiner does have a lot of recent photos of the Westerville church in his series ’40 Days of Lent.’ Gardiner has taken a some fantastic photos of the new Westerville church completed in 2011. The church has been in use since June 29, 2011. There are still many windows without stained glass. Gardiner’s photos are copyrighted and not licensed in a way that I could use them here. Of course I could pay for good, local stock photos and not what I take. Using my wretched photos to illustrate a post saying go look at good photos is not meant as disrespect. All photos here are mine… Go look at good photos on Gardner’s site. Lots of good photos of the Westerville including this church! 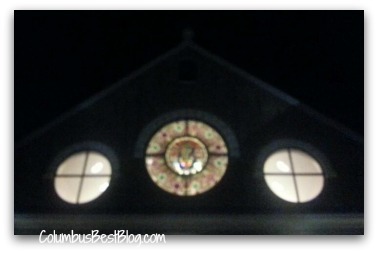 The windows in the Catholic church on State Street in Westerville are recycled. 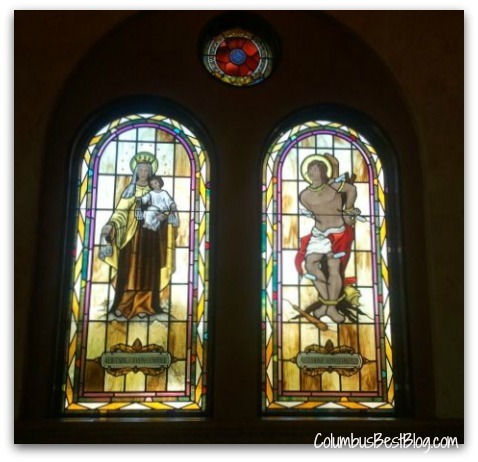 The stained glass windows are from a church or churches in Cleveland closed by the Cleveland diocese in recent years. St. Paul the Apostle Catholic Church in Westerville purchased windows and other items from the Cleveland diocese.